OK, maybe that story is embellished a little bit to make it seem shadier than it really was. But the looks and questions we got from other show attendees (and even other publishers) as we carried it around the hall for the day told us we had something special. They all wanted to know where we got it and how they could get one today. A few quipped that they were waiting on theirs to arrive via mail and they were jealous to see we had it on us. Eventually we started referring to it as “our precious” and made sure it never left our sight! Maybe to many it’ll seem silly, but our treasure that day was an unreleased copy of the brand new Skyward game by Passport Game Studios / Rule & Make. It was a title we weren’t familiar with at all, but the artwork on the box was absolutely gorgeous. We knew if as much attention to detail was spent on the game as was on the box, it would be one we would not part with. Imagine a time in the future and the proposed existence of an airborne city called Skyward.You can probably imagine the difficulty of constructing such a community, the least of which is how to get it up there! That’s a problem for future-us to figure out, in the meantime we’ll try to show them what the most efficient metropolis looks like. Included in the small box is a game board, a number of over-sized cards and some cardboard cogs. Most of the cards are buildings which you are trying to construct up above. 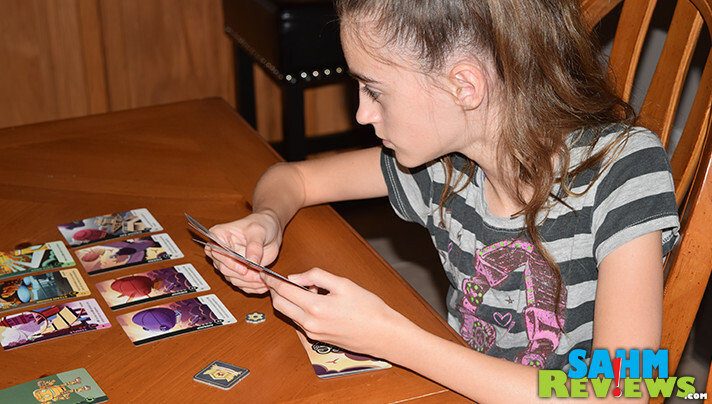 There are also 28 faction cards along with a couple vehicles and critters. 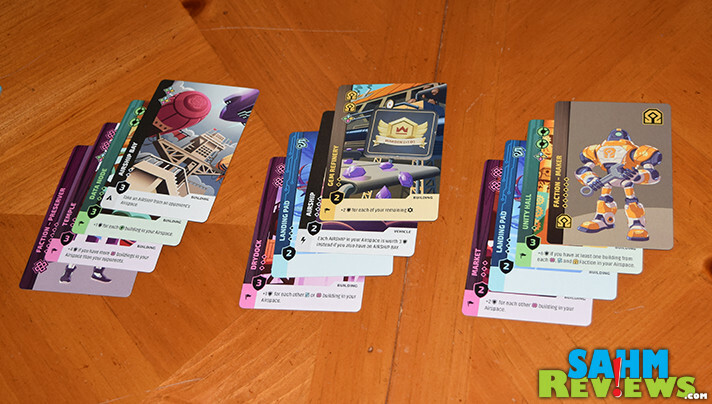 You might consider the faction cards to be the currency of Skyward, as you will need to pair them up with the correct buildings in order to launch/build them. 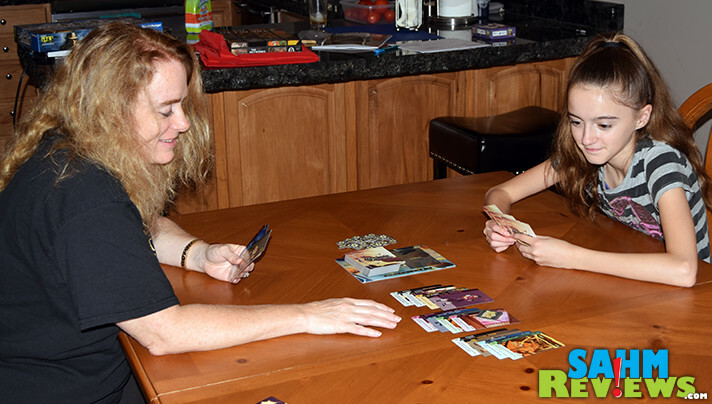 Cards aren’t just dealt to the players in Skyward. 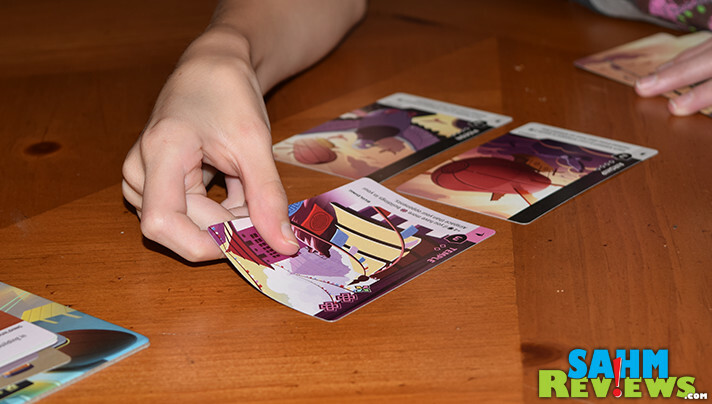 This game uses one of our favorite mechanics, one that we talked about in our New York Slice game overview – the “you split, I’ll choose” we all dealt with when we were kids and had to share a cookie. 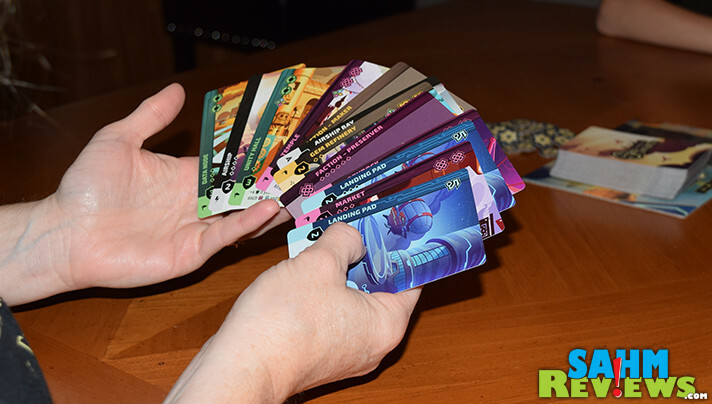 In the case of Skyward, the Warden (dealer) deals out four cards per player into one stack and looks at them. They then decide how to arrange them in stacks for each player. They do not have to be even or equitable, but the Warden gets the leftovers, so it is in their best interest to keep them rather even. The Warden token is also placed on one of the stacks and the splitting duties pass to the person who chooses that pile. They are also awarded a Cog to pay for their service. 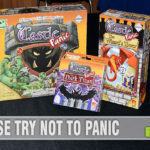 If a player chooses a pile which contains cards with a lightning bolt symbol, those resolve instantly. They are placed face-up in their Airspace instead of their hand. After everyone has chosen a stack, player turns begin. During your turn you may Launch one building from your hand into your city. Launched buildings earn you victory points at the end of the game. In order to do so you must pay the required costs by discarding Faction cards matching those symbols on the building card or by using a Cog as a Wild for one or more of the Faction cards. Then you may place the building in your Airspace. At the end of your turn you may discard any three cards from your hand and receive a Cog for doing so. You can do this as many times as you wish as long as they are in groups of three. Then discard so you have no more than six card in total in your hand. 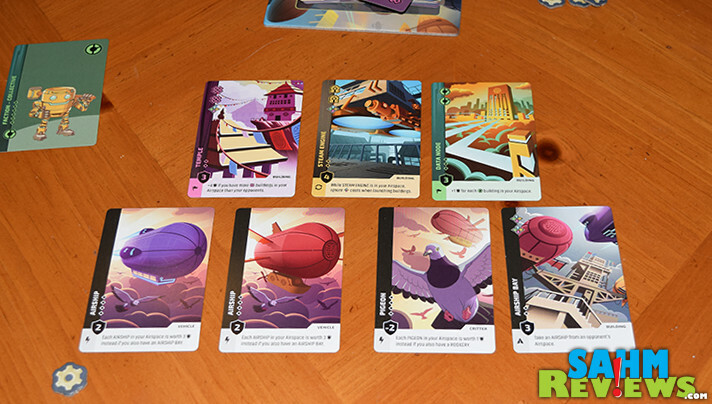 Skyward ends when the Launch deck is empty or any player has six or more buildings in their Airspace at the end of their turn. The round is finished out so everyone gets the same number of turns and then scores are tallied. Add up the values of the buildings in your Airspace, along with any points earned by special card effects. Many of the buildings award bonus points by having more of a certain type, extra cogs left over or even combo’d with ones from the same faction. The player with the highest total wins! 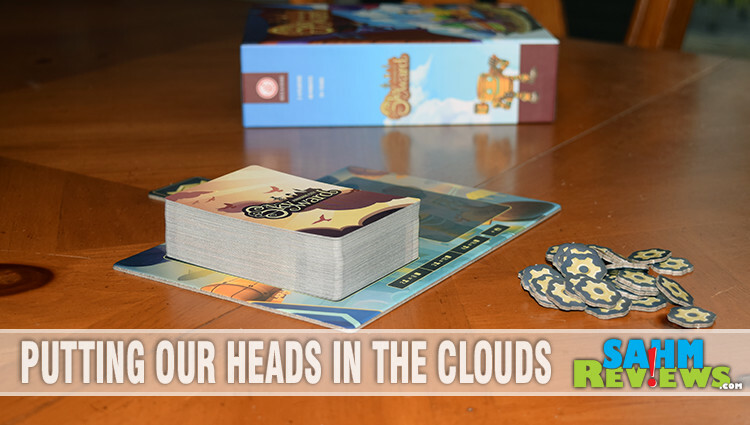 Skyward has a lot of things going for it – beautiful artwork, quick setup, easy-to-learn rules and a perfect play time of around 40 minutes. If you want your copy right away, head over to Passport Game Studios’ Gen Con booth #2549 and grab a copy before they sell out (and they will!). You can also get a copy shipped direct to you from Amazon or keep an eye out for it to hit the shelves of your local game store. Don’t think for a second this is the only thing Passport Game Studios has in the works for last few months of 2017. 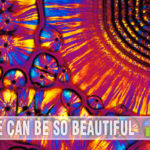 You’ll have to keep an eye on SahmReviews, as well as Passport’s Facebook and Twitter timelines to see what’s up next! Wouldn’t you love to live in a city in the sky?! I love to live in a city sky!!!!! This sounds like a great travel game, especially since there are few pieces. The cards also look really eye-catching, fun for kids! Games are really cool these days. I can’t wait till my kids are old enough to play these kind of games. Interesting game. I have to try it with my nephew because I think that he will love the design of the cards too. Not sure I’d like to actually live in a city in the sky–but I would sure like to help to build one! This game sounds like a lot of fun!! This looks like a fun game! I’m sure my boys would love it. And the graphics are great! Skyward the city in the sky should be very interesting as well as the game it’self. You give such great detail I almost feel as though I could reach through and play sometimes! You are always posting games that I haven’t heard of. My husband just mentioned this past weekend we should do a game night and I just won an amazon gift card too. I think I will get this! I originally read this as Skyshard & now wonder if I play Elder Scrolls Online too much! 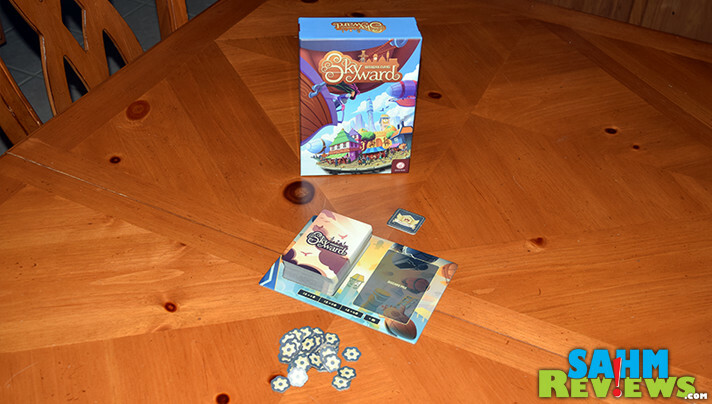 The artwork alone on this Skyward game is amazing & enough to grab my attention.